Cattle: For the treatment of bacterial pneumonia, pasteurellosis (associated with the shipping fever complex) and footrot caused or complicated by bacteria susceptible to oxytetracycline, and for the treatment of pinkeye (infectious bovine keratoconjunctivitis) caused by Moraxella bovis. Swine: For the treatment of bacterial pneumonia caused or complicated by bacteria susceptible to oxytetracycline. For treatment of bactetrial pneumonia(shipping fever) caused by pasturella multocida in cattle and sheep and erysipelas caused by erysipelothix rhusiopathiae in swine and strangles caused by streptococcus in horses. Available in: 50ml, 100ml and 500ml bottles. Also available in short acting and long acting formulas. 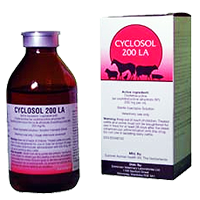 ALAMYCIN LA Injectable Solution is specially formulated to provide sustained antibiotic blood levels up to 4 days in cattle and pigs following a single treatment. ALAMYCIN LA Injectable Solution is indicated in the treatment of infections caused by oxytetracycline susceptible bacteria in cattle and swine. Available in: 50ml, 100ml and 500ml bottles. OXYTETRACYCLINE 100 LP is indicated in the treatment of all infections caused by oxytetracycline sensitive bacteria in cattle, swine and sheep. Cattle: Bacterial pneumonia, pasteurellosis (associated with shipping fever complex), mastitis, metritis, calf scours (bacterial enteritis), foot rot, navel ill, calf diphtheria, leptospirosis, black leg/malignant edema, peritonitis and joint ill.
Swine: Erysipelas, bacterial enteritis, leptospirosis, metritis, mastitis and bacterial pneumonia. Sheep: Bacterial pneumonia, pasteurellosis, mastitis, metritis and joint ill.